If you've been the victim of a car accident, you have to deal with difficult financial and physical consequences. Besides your own health and safety, you worry about the state of your vehicle. Whether it has small dings or severe damages, your car needs professional repair. When you require extensive auto service, come to Chehalis Collision Center for top-notch frame alignment. You might think your truck or sedan is beyond repair after a serious accident like a T-bone collision. However, the experts at Chehalis Collision Center can salvage your ride with our reliable frame straightening machine, the Chief S21. 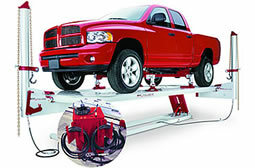 This device is built to be durable and to provide all the necessary structural alignment modifications for your vehicle. Our Chehalis, WA facility can handle all kinds of straightening because of advanced hydraulic and computerized technologies. With the proper tools, trained technicians will position your frame and axles in the right place. And before we get to work, you can consult with us to ensure whether or not you should proceed with repairs in cases where your vehicle is totaled. We believe auto repair is simple: leave all the worries to us. Our staff will help you feel comfortable in our office. We'll help you through the complexities of insurance forms, and we'll even provide rental car service so you can be where you need to be. For 40 years, the Chehalis team has welcomed clients like you and has performed countless successful repairs. You can expect all your questions and concerns to be answered by caring, personable mechanics, and customer support will be given no matter what the issue is or how long the process takes. Take advantage of our frame straightening services today by calling 360.996.4263. You can also email us at chehalis@chehaliscollisioncenter.com.